mkII L200/ max/monty/pajero brake upgrades??? Thread: mkII L200/ max/monty/pajero brake upgrades??? Anybody know of any braking upgrades for the mk2 mitey max or Montero's??? but was thinking about fitting a pair of those onto my Monty Max, if there are no mitsu 6 lug upgrades to be had. The 98-06 mk3 L200s have 2 piston calipers, but idk fittiment or if you need to use the mk3 spindles as well. custom brackets perhaps. Again LMK if anybody knows of some mitsu rear disk upgrade magic. I've no quarrels running front calipers on the back, I just hafta sort out a parking brake using the under dash pull lever. I could run a lever betwixt the seats, I've been thinking about ditching the bench for 2 buckets IDK. 2nd Gen Monteros have same diameter, but thicker rotor and 2 piston upgrade. 3rd Gen Sports are larger all around. Get the caliper too. For the rears I installed the 97-99 leaf sprung Montero Sport Rear. Its the same 9" rear you have, but its already got the rear discs installed. g'nice. i shud be able to swap the disk assemblys from the newer axle onto mine??? or is the axel itself so different i need the entire housing to make work??? ill hafta find some pictures of the differences. You need the whole rear axle as the flanges are different. Gotcha, thanks for the info. I've been looking into the Tacoma front brakes a lil bit, I don't know hat height or anything yet. But the stock 1996 Tacoma has 11.5~inch rotors w 4piston calipers stock. dust shield trimming. Tundras have 12.5inch rotors w 4 pots, and the rotor is 1/4 inch thicker too. for under $300 that's including not having cores to return. Ull need the yota banjo hoses too. Still under $300 that's not bad eh? 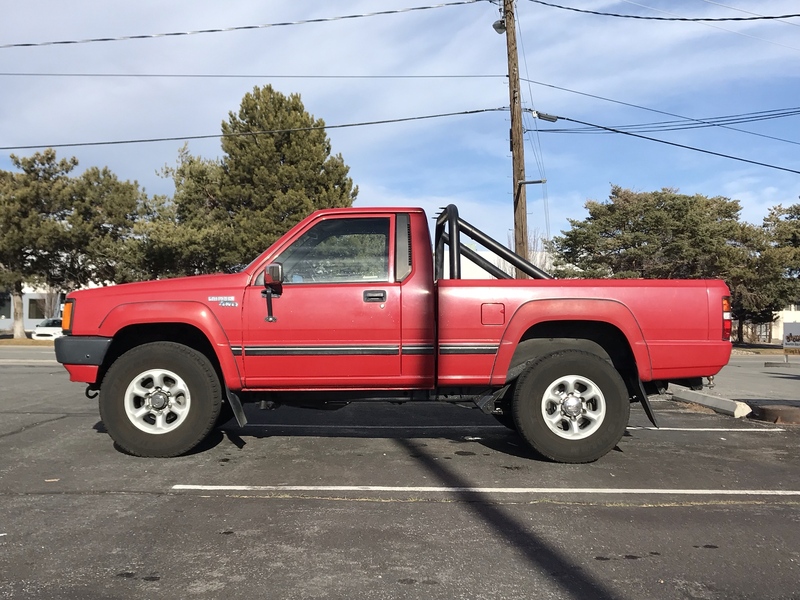 Here's the link to the Tacoma/tundra swap. Soon as I can get a wheel off each of my trucks to take some measurements w hat height & hub dia I'll post if it looks promising. My main issue is the Toyota rotors fit in between the hub & wheel, like hub, rotor, wheel. Its so funny I was excited about the tundra upgrade and mentioned it to my dad, forgetting. "That shits just braggin rights, that's all. I've never needed better brakes on anything...."
and everything he doesn't understand or agree with.... He's 64, drives, talks & acts like he's 19. Love him to death but he's such a prick, no relay between his brain & mouth at all. Ever. in a beetle-cabbed/doored pickup w custom nose. Its neat. I'll post pics up in the build thread soon. He has obviously never driven with fire coming out of his eye sockets I decimated the stock brakes in my Mitsu project hatch I'd built ages ago. The rotors cracked and were hell warped after one enthusiastic run. Swapped them up to vented oversize rotors, ceramic pads and stainless steel braided hoses and was able to hit anchors hard all night on the crazy backroads around the hills without fear of fade. ever gets stopped. He's a menace on the roads. ChargerX3 has given you good advice.